Recent findings from the National Centre for Social Research’s British Social Attitudes survey (PDF) reveal that many people are unsure about exactly what social care services are, and relatively few people have experience of using them. The survey also shows that the public has even less understanding of how social care is funded. Most people think it is funded in a similar way to the NHS – through tax revenues and free at the point of need (King’s Fund report, May 2018 – PDF). But publicly-funded care makes up only a minority of the total value of care and many people contribute their own money towards their care, as it is means tested. Improvements in living standards and clinical treatments have changed the nature of the population’s health and care needs. More people are now living longer and often with multiple long-term medical conditions, which means it’s more important than ever that people can receive the most cost-effective care, when and where they need it. Our recent publications, our overview Adult social care at a glance, and our ‘think-piece’ The health and social care interface summarise our most recent work on adult social care. They explain how the social care system operates, the pressures it is facing and, crucially, how it works alongside the NHS. Most care is provided informally by unpaid family, friends and neighbours, who provide personal care, practical help and coordinate formal services. Estimates of the value of informal care are as high as £100 billion per year. By contrast, the total value of care arranged by local authorities in 2016-17 was £20.4 billion, a level of spending they have struggled to maintain. While the NHS is a familiar public institution, free at the point of use, adult social care is a much less visible service, for which people need to meet national eligibility criteria to access, and, if the local authority charges for the required type of support, undergo means-testing. Over the period 2010-11 to 2017-18, local authorities experienced a real-terms reduction in spending power (government funding and council tax) of 28.6%. Between 2010-11 and 2016-17, local authorities reduced real-terms spending on adult social care by 5.3%. In contrast, between 2013-14 and 2018-19, NHS England’s budget increased by an average of 2.1% per year, although this was lower than the long-term average growth in health spending of 3.7% per year. The impact of funding reductions is evident in both the social care market and workforce. There is evidence that the fees currently being paid by local authorities to care providers are not sufficient to sustain the current levels of care. The Competition and Markets Authority’s November 2017 report found that many care homes, particularly those that are most reliant on local authority-funded residents, are not currently in a sustainable position. In 2016-17, local authorities paid on average £15.52 to external providers for one hour of homecare. This is 16% below the £18.01 rate the United Kingdom Home Care Association has said is necessary for homecare providers to deliver sustainable services. Providers are having increasing difficulty recruiting and retaining workers, despite rising demand. In 2016-17, the annual turnover of all care staff was 27.8%. The proportion of vacancies in care rose from 5.5% in 2012-13 to a peak of 7.0% in 2015-16, falling slightly to 6.6% in 2016-17. 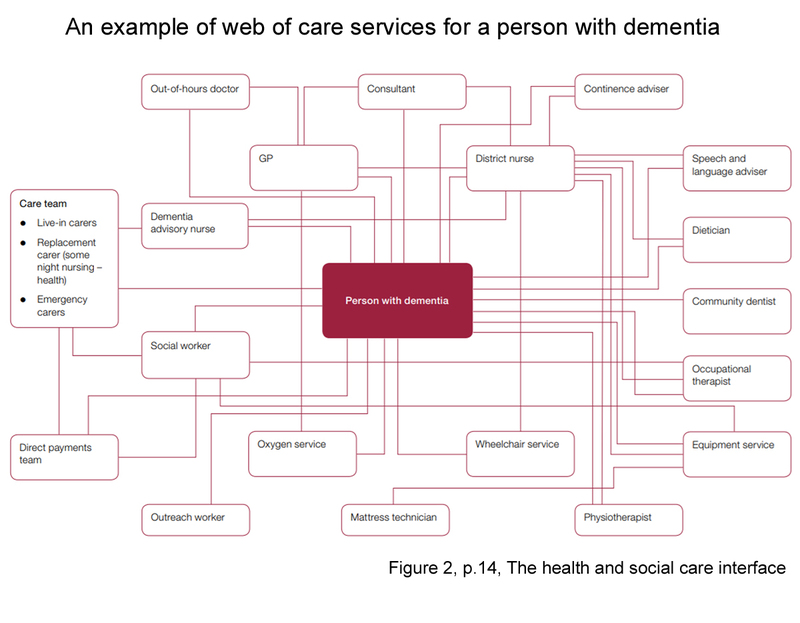 From the perspective of users, both the NHS and social care are made up of a complex range of organisations, professionals and services (click on diagram to see in detail). This can lead to uncoordinated and fragmented care, particularly for older people who are more likely to have multiple needs, and who are the biggest users of health and social care services. Financial pressures on the NHS and local government make closer working between them difficult and can divert them from focusing on transformation. The NHS and local authorities operate in very different ways, and both sides can have a poor understanding of how the other side’s decisions are made. Problems with sharing data across health and social care can prevent an individual’s care from being coordinated smoothly. New job roles and new ways of working could help to support person-centred care, but it is difficult to develop these because of the divide between the health and social care workforces. Further details of these issues can be found in Adult social care at a glance, and The health and social care interface. We have also published a number of other social care blog-posts. We look forward to the long-awaited social care green paper, now scheduled for autumn 2018, which the government has said (speech by the Secretary of State) will put forward proposals to reform social care, better integrate services and put social care on a long-term, sustainable footing. As always, we would welcome your comments and invite you to contact us if you would like to discuss any of the issues raised in this post. About the author: James Beveridge is a value-for-money study lead at the NAO. Since joining in 2012, James has led studies looking at the implementation of the Care Act, delayed discharges, health and social care integration and emergency hospital admissions. Previously James worked at the Audit Commission as an auditor of local authorities, clinical commissioning groups and NHS trusts. 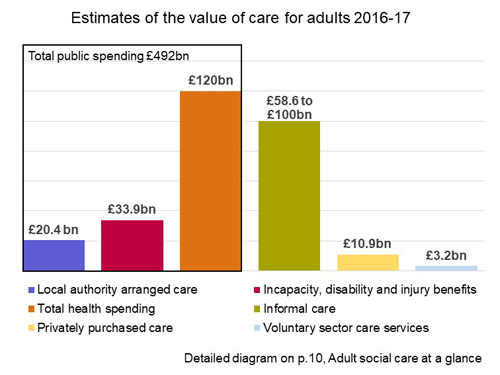 Congratulations on the diagram showing estimates of the value of social care. Might it not show that the levels of informal care is much higher elsewhere? What leads therefore to the conclusion that integration is realistic, affordable and deliverable? As you may be aware, our role is to hold the UK government to account for how it spends public money – we don’t question government policy objectives, but provide analysis to Parliament on progress towards such objectives and how public money has been spent towards achieving them. There is a long-standing government objective to join up health and care services – reflected in the department’s name change. It is not our role to assess whether this policy is, as you ask, ‘realistic, affordable and deliverable’, but to review government progress against its own objectives and whether the policy represents value for money. In our report The health and social care interface we acknowledge the achievements to date, but conclude that the government has made slow progress towards integration. For the same reasons, we have not conducted any international comparisons as part of our work. You may wish to refer to recent work the Kings Fund and the Nuffield Trust have done to look at how health spending in the UK compares internationally. The Audit Commission Office is NOT PROTECTING the PUBLIC PURSE for the following reasons: who are aware of my in depth study regarding the payments being made to LA via the DWP Subsidy Div: ‘illegally’because the DWP do NOT provide a ‘Set of Regulations’ that the ‘external auditor’ can work from. ‘Spot Checks’ have NOT identified the ‘illegal’ ‘charges’ added to Housing Benefit applications: claiming ‘EXEMPT’ status when CASE LAW clearly states you cannot claim this status if the LA Contract out to a Private Provider to provide the SUPPORT for those living in ‘SUPPORTED ACCOMMODATION’ unregulated, or minimal or no support is provided, it is ‘illegal’. SERVICE CHARGES are also NOT checked, many ‘vulnerable’ adults notice these added by SUPPORT AGENCIES or other, but receive no replacements of ‘weekly amounts’ shown on their Housing Benefit forms.The question is who are the WINNERS? the Housing Association who receive this added payment for EXEMPT accommodation? ‘illegal’ and the LA who receive a nice HB/SUBSIDY also ‘illegal’. It is important that those placed in ‘Supported Accommodation’ unregulated are PROTECTED. Many are subject to Section 117 of the 1983 MHA. FREE Aftercare, yet charged under a HEADING’ ‘intensive Housing Services Management’actually SUPPORT? I made my request to the ‘external auditor’ to carry out a re-audit of those known to be subject to FREE Aftercare, but refused. The DWP are responsible for the ‘set of regulations’ for the ‘external auditor’ to refer, but the DWP were not forthcoming either. The NAO have been involved with a number of my correspondence but i am afraid there is little understanding of how the ‘system’ operates. I now refer to the NAO who i presume AUDIT the Accounts of the DWP HB/Subsidy Division. I am TALKING Thousands being refunded by a system that has no means of knowing if their AUDIT is CORRECT: IT IS NOT. I have the EVIDENCE. The losers are the General Public, and the ‘vulnerable’ who have no idea they are being charged ‘illegally’. I am happy to speak to you, to discuss how the system is operating, and how this ‘illegal’ practice is continuing. Many Individuals are entitled to a Personal Budget by LAW, it dosn’t happen for many, FREE Accommodation under the Care Act for many, but ignored. ‘EXEMPT’ CRITERIA paid ‘illegally’ is NOT value for money,those with Mental Illness are the worst effected, often no care or support provided. Interesting. Just had an ombudsman complaint upheld. Norfolk County Council failed to comply with the Care Act. Rather than just the financial issue, there is an unwillingness to give good care. When I pointed out that they were paying out money for services not delivered they were not interested. So money goes into Agencies with poor or inadequate monitoring. Unfortunately Alzheimers and other types of dementia isn’t always as straightforward as just social care, sometimes with complex needs (care by more than one discipline ) one needs more intense nursing needs. Also when someone is nearing the end of life with Alzheimers there are other factors that need more care than S/S are legally able to supply. It is so good to see some serious discussion about the long overdue need to integrate our health and social care sector. The need to prevent arguments at case reviews about someone with a mental health issue being ready or not to come out of psychiatric hospital ……. the actual need of the individual being played off against the budget available to the social worker for the right level social care in the community and the desire of the psychiatrist to free up a bed. I know the figures are from 2016-2017 but £15.52 average for 1 hour home support paid by local authorities is disgusting. 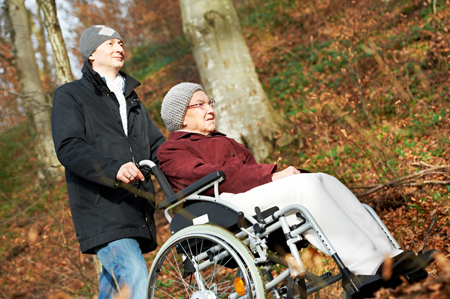 Care workers are skilled professionals and have a very difficult job. They also have to constantly keep their training up to date to fall in line with legislation and policy and to provide the best outcomes for the individuals they support, moreso than in other industries. If you asked a plumber to come out for a home visit for fifteen quid you’d (quite rightly) be laughed at.